Maintain a healthy weight; it's one of the best things you can do for your knees. Every extra pound puts additional strain on your joints, increasing the risk of injuries and osteoarthritis. Be in shape to play your sport. To prepare your muscles for the demands of sports participation, take time for conditioning. Work with a coach or trainer to ensure that your technique and movement are the best they can be. Because weak muscles are a leading cause of knee injuries, you'll benefit from building up your quadriceps and hamstrings, which support your knees. Balance and stability training helps the muscles around your knees work together more effectively. And because tight muscles also can contribute to injury, stretching is important. Try to include flexibility exercises in your workouts. If you have osteoarthritis, chronic knee pain or recurring injuries, you may need to change the way you exercise. Consider switching to swimming, water aerobics or other low-impact activities — at least for a few days a week. Sometimes simply limiting high-impact activities will provide relief. Over-the-counter medications - such as acetaminophen (Tylenol, others), ibuprofen (Advil, Motrin IB, others) and naproxen (Aleve, others) - may help ease knee pain. Some people find relief by rubbing their knees with creams containing a numbing agent, such as lidocaine or capsaicin, the substance that makes chili peppers hot. Take a break from your normal activities to reduce repetitive strain on your knee, give the injury time to heal and help prevent further damage. A day or two of rest may be all you need for a minor injury. More severe damage is likely to need a longer recovery time. Ice reduces both pain and inflammation. 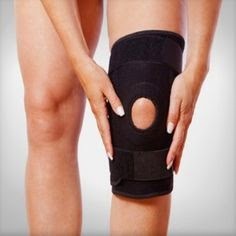 A bag of frozen peas works well because it covers your whole knee. You can also use an ice pack wrapped in a thin towel to protect your skin. Although ice therapy is generally safe and effective, don't use ice for longer than 20 minutes at a time because of the risk of damage to your nerves and skin. This helps prevent fluid buildup in damaged tissues and maintains knee alignment and stability. Look for a compression bandage that's lightweight, breathable and self-adhesive. It should be tight enough to support your knee without interfering with circulation. To help reduce swelling, try propping your injured leg on pillows or sitting in a recliner. Stretch and strengthen the hamstrings, hip flexors and quadriceps, particularly the VMO (Vastus Medialis Oblique) muscles at least three times a week. Make a point to lose extra weight. Do not try high impact activities until you have lost those extra pounds. Ask your doctor if you might be a candidate for orthotic inserts to counter pronation problems. Cross-train. For example, if you’re a daily runner, consider cutting back to three runs a week and choosing a low impact activity like cycling or an elliptical trainer on the other days. As you age, avoid sports that require frequent pivots, starts and stops (e.g., soccer and basketball).